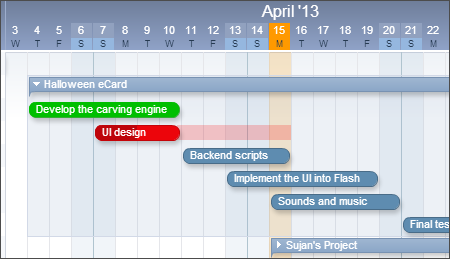 Today we finally released the new updated Timeline – version 2! While it may look familiar to you, it has been totally rebuilt. Besides the numerous small improvements, we also added big new feature like an advanced print mode and a project/task names list panel. Since the new Timeline is a totally new version, it is released as a beta right now. You can switch between the old and new version in the Timeline tab. Feel free to give it a try and let us know what you think. unfortunately the order in the jump to project dropdown is still anything but alphabetical. It’s in a custom sort order – the same as in the main view. Latest on the top, by default, or in the order you dragged them in the main view. Hi, is that possible to configure each Saturday and Sunday as non-working days? Do to automatic shifts of sub-tasks in creates too many situations when tasks will end up hidden by weekends.